Our tour group in Tiananmen Square, with the iconic entrance to the Forbidden City, adorned with Mao’s picture, in background. 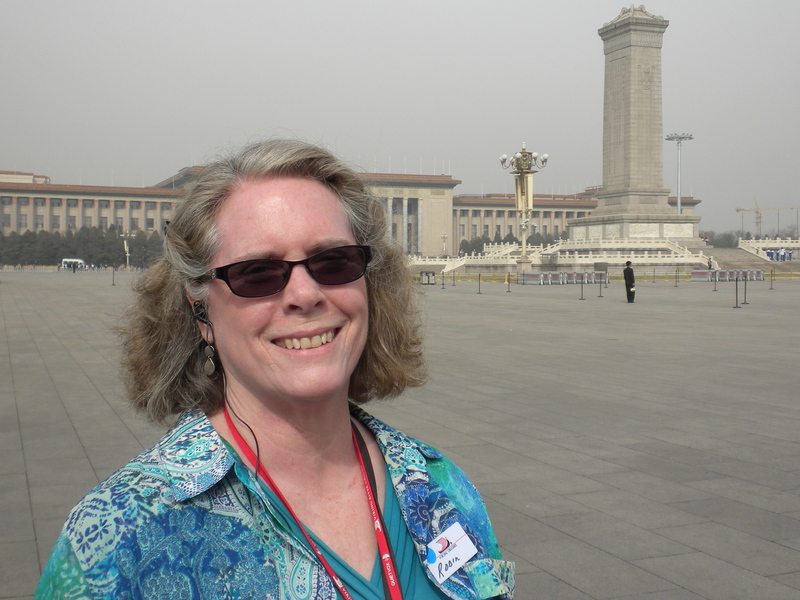 Today we went to Tiananmen Square and the Forbidden City. I decided it was better when it was forbidden because now it has lots of tourists. Tiananmen Square comprises 109 acres, one of the largest public squares in the world, but it was still overrun with people, most of them from rural areas of China. You could spot them because they tended to wear matching hats. There were also a few groups of Western tourists. 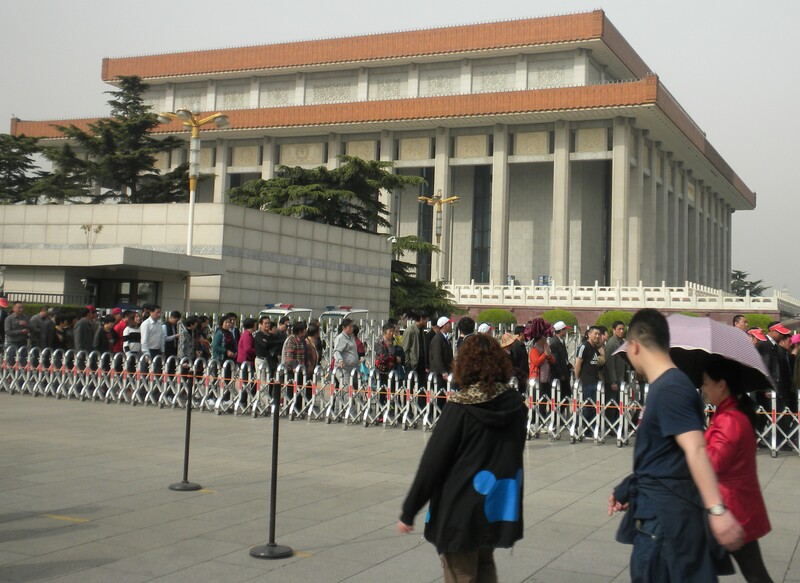 The square would have been completely full except that a large area between Mao’s tomb and Great Hall of the People, where the Chinese Peoples Congress and the Chinese Communist Party meet, was cordoned off for some kind of ceremony at the parliament building. You have to line up and pass through a security check to get into the square, but the line moves pretty fast. Chinese tourists stand in line for hours for a brief glimpse of Mao’s body. Hundreds of Chinese tourists were lined up all the way around the Mao’s tomb waiting to view his body. Mao wanted to be cremated, but the Chinese government, following the example of the Russians with Lenin, decided to embalm him and put him on display. At night he is lowered into a freezer to be kept as fresh as a dead person can be, and he gets Sundays off. We did not join the line because, as our guide Matthew said, the Forbidden City is a lot more interesting than a dead body. Also on the square is the Chinese history museum. 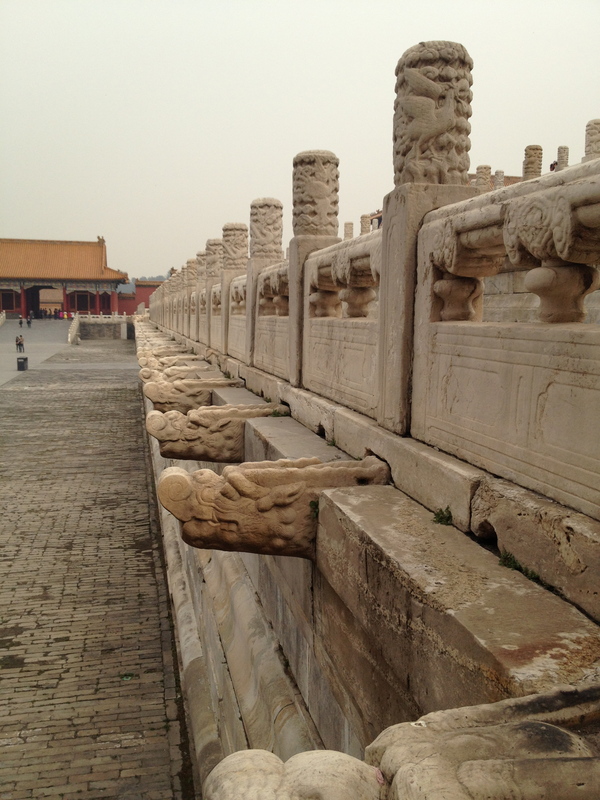 That would have been an interesting place to visit, but the Forbidden City, now called the Forbidden Museum, awaited. 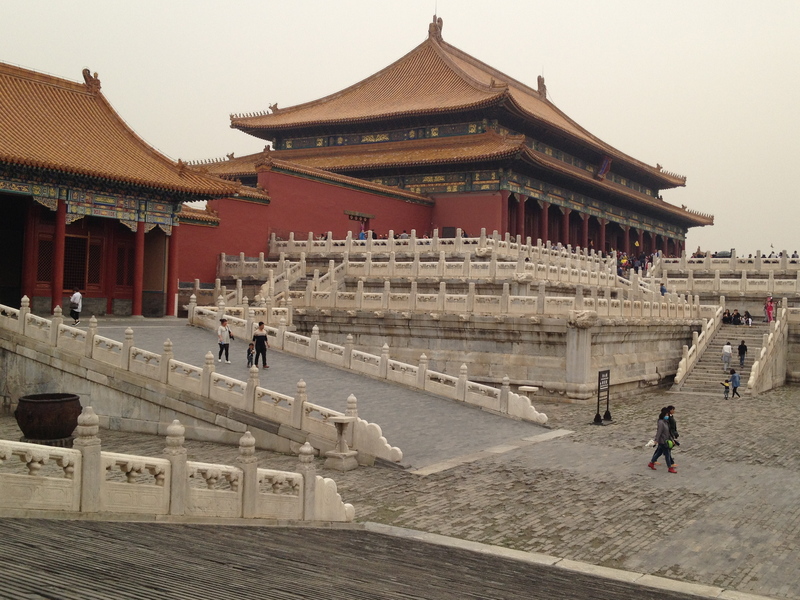 The Forbidden City, built in the 15th century, consists of multiple spacious courtyards surrounded by large buildings. The courtyards are along an axis, similar to what we saw at the Lama Temple and Temple of Heaven but on a much larger scale. 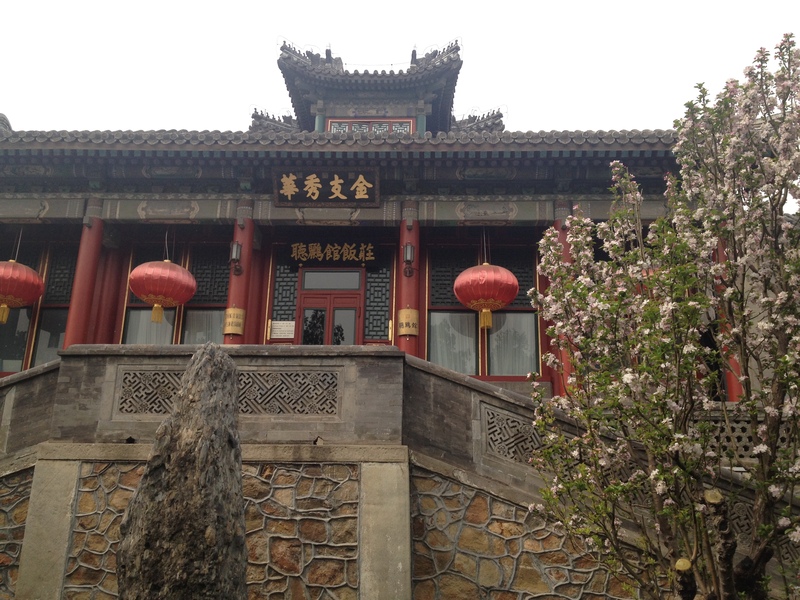 The outer courtyards were used by the emperor and his ministers for official business. The innermost courtyard was where the emperor lived with his wife and concubines. 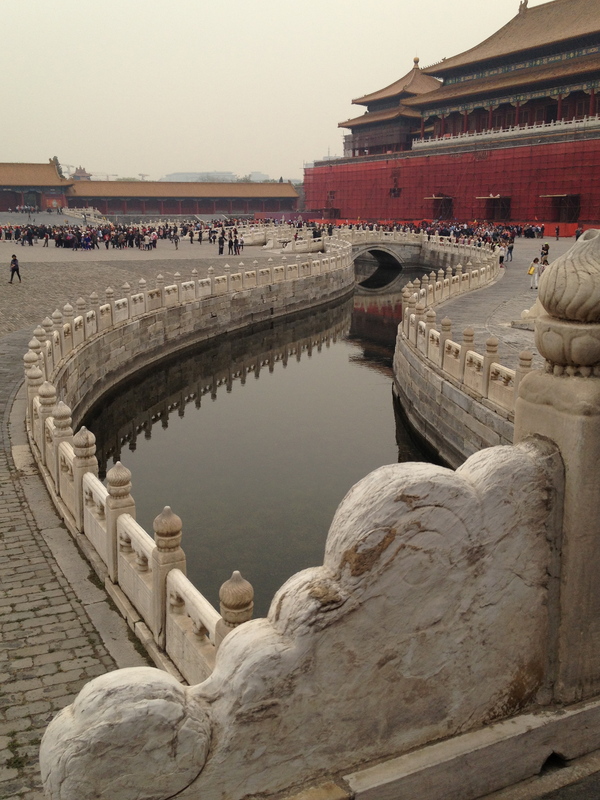 In the Forbidden City, even the drains are decorative. The emperor lived in a building called the Hall of Mental Cultivation, while the empress resided in the Hall of Consolation, which she may have needed due to the presence of the emperor’s many concubines, which often numbered in the hundreds. 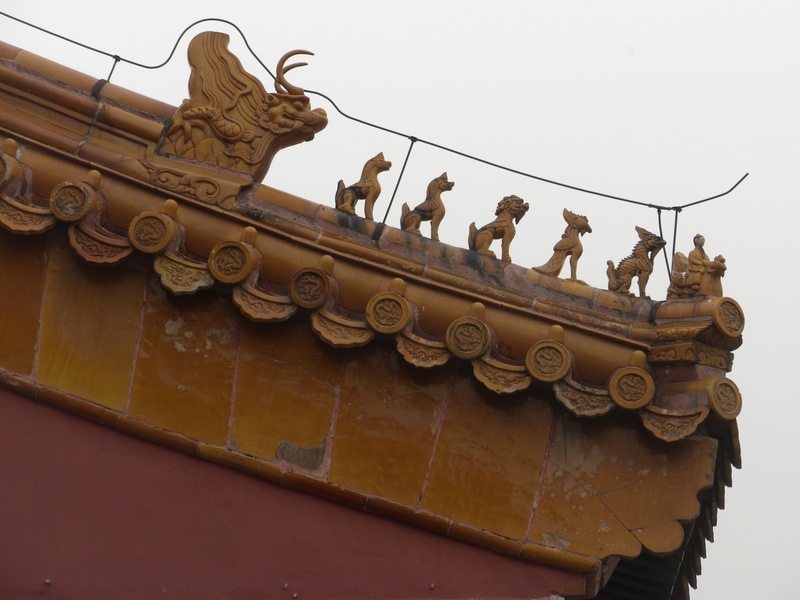 Other buildings in the Forbidden City included the Hall of Heavenly Purity, the Hall of Supreme Harmony, and the Palace of Earthly Tranquility. We were not able to go into the buildings, but we did get to peer into the emperor’s bedchamber and those of some of the concubines. They were actually more modest than I expected, but Robin pointed that they probably did not contain everything that they did when they were in use. I later learned that the Chinese government is planning to build a complex on the outskirts of Beijing to hold many of the 1.8 million artifacts that cannot be displayed in the Forbidden City because of lack of space and concerns about security. We had lunch at an odd “restaurant” that was in with some other warehouse-looking buildings. The food was good, but the facility was just one big room, like a banquet hall, and the staff seemed a little surly. Matthew explained later that the restaurant had catered to government officials who did want to eat in a regular restaurant with ordinary people. When President Xi Jinping cracked down in such practices, the restaurant lost a lot of its business and was having to get used to serving tourists and other low life. After lunch we went to the Summer Palace, built in the 18th century as a retreat for emperors, empresses, and their courts. It is even larger than the Forbidden City, though 70 percent of it is taken up with a huge, man-made lake that was ostensibly created to give the Chinese navy a place to train. 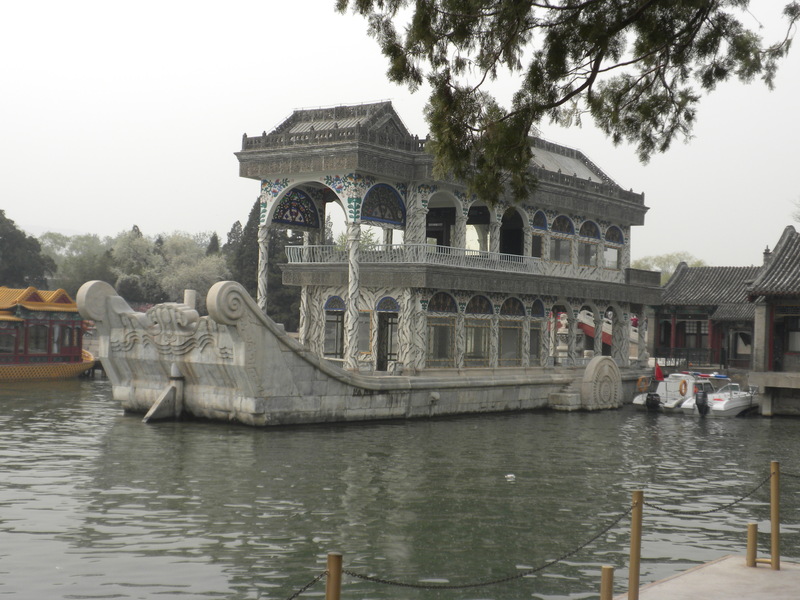 We rode across the lake in a dragon boat and then wandered along the shore. One building at the Summer Palace is called the Hall for Listening to Orioles, but not because the emperor was a fan of Baltimore’s baseball team. Rather it was for listening to the opera, and in olden times people often compared beautiful singing voices to those of orioles. We discovered that we too were tourist attractions. Many rural Chinese have never seen Westerners before and many waved to us and said hello. At one point a woman sat next to Robin and had her friend take her photo with the exotic Occidental. We were told that this is common. 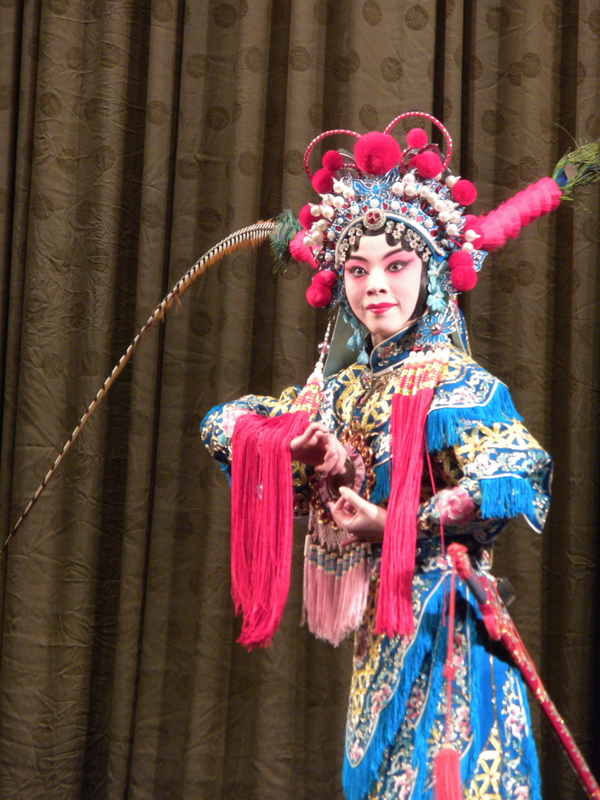 After a delicious buffet dinner at the hotel, we went off to the Beijing Opera, a traditional art form here. This turned out to be nothing like a Western opera. It was a stylized and at times acrobatic performance with beautiful costumes, masks, and make-up, a lot of mime and acrobatics, and only a little singing and music. To watch, we sat at tables with tea and munchies. It was a one-hour performance that told three stories. There were English translations on screens (and Chinese subtitles too because the dialects used in the opera are not understood by most Chinese), but the plots made about as much sense as the plots of Italian operas. We were glad we got to see it, but it must be an acquired taste. The other two men at our table fell asleep, and I was surprised that I did not. I understand why in olden times Chinese who watched were said to chat during the performance. One of the other couples at our table turned out to be from Whidbey. 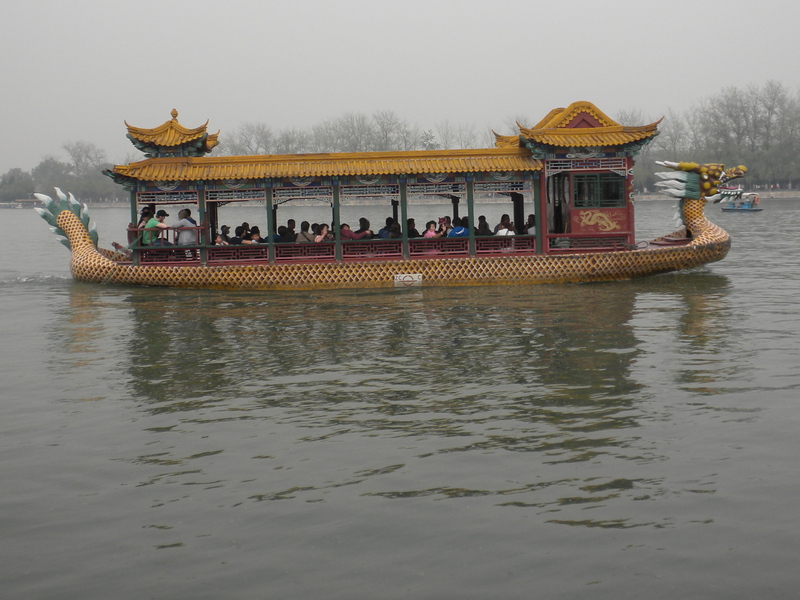 What are the chances that, in a group of 35 American tourists in China, four would come from the same island? 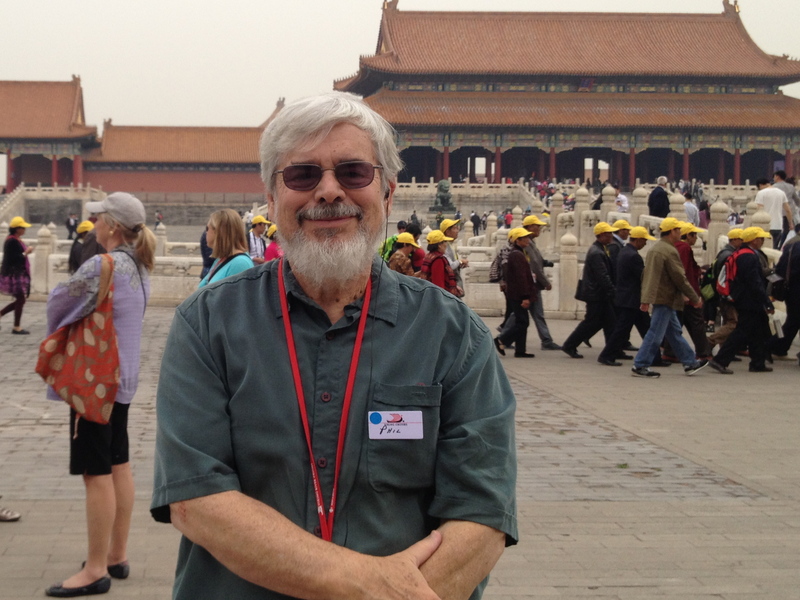 After the opera, it was off to bed to prepare for tomorrow’s visit to the Great Wall. “The Hall of Heavenly Purity, the Hall of Supreme Harmony, and the Palace of Earthly Tranquility” … They’d make me yearn for Monty Python’s Argument Clinic.